Recently I have had a nagging feeling in the pit of my stomach. I look around me and I see so many loose ends I have left unfinished. As I evaluate my life, I am realizing that this seems to be a consistent trend throughout my life. There are so many things I have started I haven't seen through to the end. Some may call me a quitter, unmotivated, lazy, or undriven. I don't see myself as any of those things. I see myself as distracted. At the young age of 23, I was left alone to care for 2 small children. While I adamantly claim to not let my role as the only parent of two define my life, as I reflect, I see that I have been lying to myself. So many of my hopes and dreams for my life have been pushed to the wayside to accomodate the hopes and dreams of the young idealists living in my home. My time, after all, has passed. This is their time to rise and shine and to chase their dreams across the landscapes of their lives. Or is it? Does it really have to be that way? Do I really have to forego my dreams to facilitate theirs? When I started this blog in September of 2009, I was hoping to create a place to share my life and interact with people who may relate to me. At some point I feel I lost my funny and began to feel like the things I wanted to share really weren't so interesting. I met people who had lost children or were unable to conceive children and stopped feeling comfortable sharing my exasperation with mine. Yes, my ADHD/ODD daughter is a handful and very frequently exhausting, but she is mine, and she is a gift. I stopped dating around and developed a relationship with a man that wants to be a part of my and my children's lives. As the relationship grew and boundaries were tested, I chose to not share details of "us" as to not betray his trust. So what then was left for me to blog about? 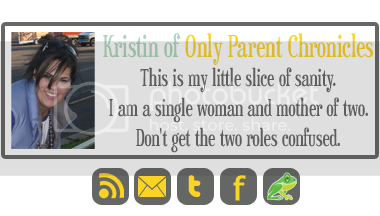 After all, Only Parent Chronicles was to be about parenting alone and dating! 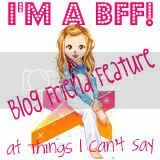 It's no secret that through blogging, I have developed a tightly knit group of friends I call the Bishes. Just last night I mentioned to them that I was going to step away from blogging for awhile. Honestly, I felt as though I really didn't have anything left to share. Today, I received a text message from a person very dear to my heart. It said, "ur a great person and deal with so much stuff u need to at least make urself happy. can u promise me that u will think hard about what that will take and not be scared to make the changes needed?" That's when it hit me. There are so many things I love to do. For so long, I have put those things on a shelf and put myself second to my children. Yes, my children are my priority and yes, providing for them and nuturing their dreams is my job. But does it really have to be in lieu of mine? There are things I want in this life that I do not currently have, but I do have the means to get there. I am a smart, fun, and creative woman. Just like I tell my kids, if there is something I want in life, I can have it. I just have to be willing to put in the work. No more loose ends, no more unfinished business. This blog included. I will not be stepping away from blogging. I love my blog and I love my home in Blognia. Blogging makes me happy. That said, my 1st blogoversary is September 15. I'm crazy excited! To celebrate, I am hoping to host a celebratory Twitter Party. In addition, I am hoping to have giveaways and other fun, celebratory stuff going on. If you would like to participate by sponsoring my party or offering a giveaway of some sort, please contact me. In the meantime, I am going to be putting together details and working on other stuff that makes me happy. Happy mama = happy kiddos, after all! sweetheart what you named your blog does not define what you can blog about. You can change your title ya know and your true supporters like me will follow cause we love you. It ain't about being 'on' all that time it is about being the authentic you all the time.. Thank goodness this post did not end at "... I was going to step away from blogging for a while." I hope you realize that you touch many people with your blog. Finding your blog was the first time I experienced a sense that there was somebody out there with a past that had similarities to mine. As I read your story I felt a connection, even though we had never met. Keep bloggin mama - we need you! Yay! For not leaving! I must have missed where you were thinking about leaving, I think everyone has those moments. Do what makes you happy, you can't take care of others if you don't first take care of yourself. I am so glad that you wrote this blog! I had a dream about you the other night and then today I was wondering why you haven't blogged in awhile. I guess this answers it. You are a fantastic woman and a fantastic mother to two special kids. Do what you need to do to make YOU happy. The rest will fall into place. I am so glad you aren't going anywhere. Blognia (love that!) is a brighter place with you in it! Happy almost Blogoversary to you! Mine is a week before yours and I can't believe I've almost been at this a year already! Maybe I could make something pretty for you to give away? This post made this BISH HAPPY!!!!! You are a strong beautiful woman and I for one am glad to see you staying put! Aaaaand, I am stoked to SEE you in September! Ditto what they all said. and sometimes, blogging makes you feel like the person you wanted to be all along, it's still inside of you. There are sooooo many of us out there that feel the same way. I haven't dated in well over a year and I'm the single dating mommy. Alas, blogging is cheaper than therapy, and I love reading your posts. They make me realize I'm not alone and I'm actually in some pretty good company. Good decision. Good for you! Maybe STICKMAN will stop by to wish his old friend Happy Blogoversary. It's so much easier to lose yourself in motherhood than it is to struggle to maintain a piece of the woman you are. It's why so many women lose themselves in motherhood. I'm not saying it's a bad thing, it's just the easiest thing. Like you, I think it's important to retain a piece of that woman outside of motherhood. Glad you've decided to stick around. I would be happy to contribute to your Blogoversary!! Good for you. You do need to be happy and you have everything it takes to make that happy! Absolutely! We may come into blogging for certain reasons, but the beauty of it is it's still our blog and it can change and grow with us. I'm going through that a bit myself...How dare I whine about my kids, when there is so much heartache out there? I always think twice when I start to blog and it didn't used to be that way. But...anyway. Glad you're not going anywhere. You will always be one of my favorite bloggers, even though I don't read everyone's blogs as much as I used to. I'm trying to work on that. Happy to hear you're not going anywhere. Quit whining, cousin!!! And get to Illinois C R A Z Y fast!!! Love you more than peanut butter and chocolate! Since I haven't been following you to long...I am glad you are staying! !